From the sounds of their self-congratulatory statement last week, you'd get the sense the federal agents who run the dams along the Columbia and Snake rivers have figured out how to save imperiled salmon and steelhead runs. "To date, performance testing indicates that all projects are on track to meet the bi-op (biological opinion) performance standards of 96 percent survival for spring migrating fish and 93 percent survival for summer migrants," reported the Bonneville Power Administration, the U.S. Army Corps of Engineers and the U.S. Bureau of Reclamation. But what would real success look like? Wouldn't it suggest fish numbers approaching the abundance in the days before the dams were built? That would mean wild Snake River spring/summer chinook runs in the range of 80,000 fish. Today, the number of chinook returning to the Snake River is estimated at 41,900 - split about evenly between wild and hatchery fish. That would mean steelhead runs in the range of 90,000 fish. 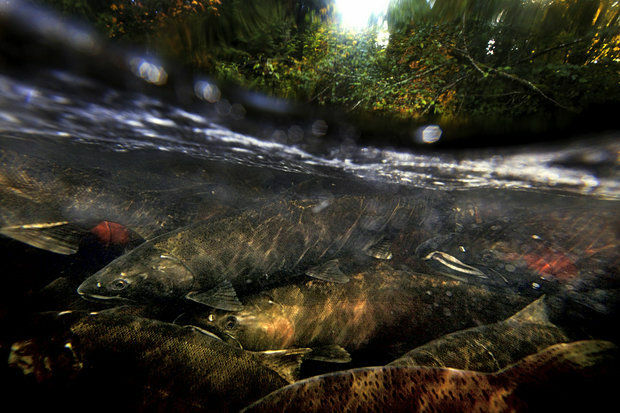 Last year, 23,000 wild steelhead returned to the river system. Returning wild sockeye once numbered about 10,000. If it weren't for hatchery-bred fish, Idaho would have no sockeyes at all. Those wild fish are vital because they are the genetic broodstock of the species. As long as those wild fish populations are suppressed, the species will remain endangered. If the dam operators had mastered the intricacies of preserving fish, would they have to rely so extensively on a network of hatcheries? No question, there are more fish now than in the 1990s. But only one adult fish returns to Idaho spawning grounds for every 100 smolts that leave for the ocean. And it's the less genetically diverse hatchery fish that have provided the numbers sufficient to allow some fishing. If the federal agencies were so adroit at enhancing fish runs, wouldn't fishing seasons last as long as the fish runs - rather than the truncated seasons fish and game agencies authorize along the network of rivers? At minimum, wouldn't success in preserving wild fish involve a self-sustaining natural rhythm? Instead, Northwest power ratepayers are shelling out more than $600 million a year - and more than $7.35 billion during the last 11 years - just to prop up the system with hatcheries, transportation, habitat restoration and dam renovations. And wouldn't success in saving the fish point to an end to costly litigation pitting dam managers against conservationists? Instead, wouldn't you see former adversaries joining hands and singing Kumbaya from Salmon,Idaho, to Astoria, Ore.? In the last 15 years, federal judges have tossed out four prior fish recovery plans - called biological opinions - as being insufficient and illegal under the Endangered Species Act. The cycle of studies, lawsuits and reversals has cost more than $10 billion. A fifth bi-op, which is due out this fall. Last week's outline of progress was meant for the federal courts as much as the public. The ink on that statement was not even dry before fish advocates were pointing out its shortcomings. You can bet they'll have same reaction to any bi-op that repeats the strategies of the first four. In the absence of the big table collaborative approach favored by people such as Sens. Mike Crapo and Jim Risch, both R-Idaho, Oregon Gov. John Kitzhaber and Trout Unlimited President Chris Wood, it's back to court we go. Does that look and sound like success to you? It's Early Yet for Self-Congratulations, Isn't It?